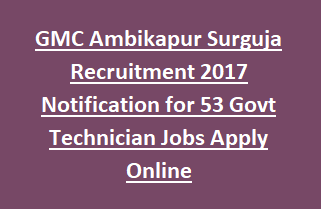 Ambikapur GMC Govt Technician Jobs Recruitment 2017 for Medico Social Worker, Technical Assistant, Assistant Librarian, Technician, Catlogar, Library Assistant, Driver, Radiographer Jobs Interested candidates should apply from the starting date of online application from 18-09-2017 and closing date will be 27-09-2017. Social worker Jobs-Candidates should have passed Any Degree or Diploma. Driver: GMC Driver Jobs Applied candidates Should have minimum exp and certified by the state govt Other posts wise educational qualification details please go to the official notification. GMC Govt Technician Jobs Interested Candidate’s age limit should be Minimum 18 year and Maximum 40 year. Age Relaxation will be applicable for the reserved category candidates as per Government Rule Regulation. Candidate will be selected based on the performance in the interview. Other Post wise selection process details go to official website.